Since completing my residency at the North Carolina Pottery Center last summer, I've found excuses to go south again and again. This last trip down to the Pottery Capitol was to fire my best potter friend's gas/salt kiln. You've heard mention of him before on my IG, Facebook, most recently in my shop, and now I'll introduce him on my blog! He's deserving of his own blog post, but for now, I'll introduce him in this post. Meet Chad Brown! He's a 5th generation, Seagrove Potter. Chad is seated in his newly constructed 30' long wood kiln. Like I said, he needs a post of his own, but for now, you can learn more about Chad, his pots, and wood kiln on his website, here! And this is the gas/salt kiln that we fired last week--she's a soft brick downdraft kiln Chad built early on his career. Chad's estimated that he's fired this kiln about 100+ times. The shop in Carlisle is full of fresh pots thanks to Chad's invitation to come down and fire again. 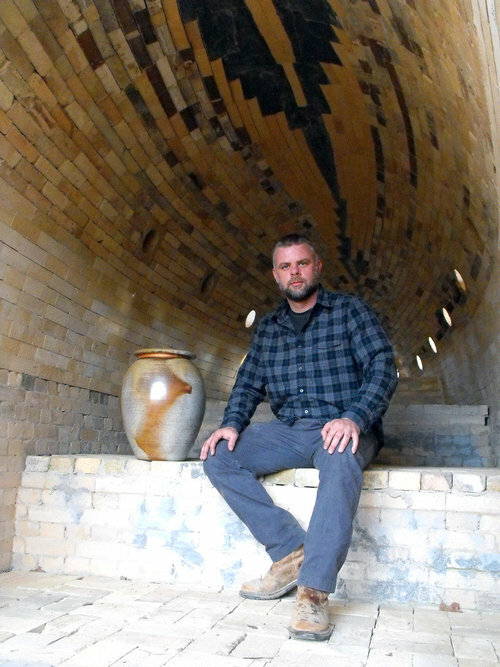 Chad built the gas/salt kiln when he was in his mid-twenties during his transition from production pottery to his own pottery. He's fired this kiln nearly 100+ times and knows it like the back of his hand! I've learned a lot from Chad after firing with him several times--not just this kiln, but even the groundhog and the noborigama at the Pottery Center. He's taught me that firing kilns is more than just achieving a goal temperature. You have to be able to read the kiln, the flame, the cones, the gas or wood for each and every firing. Once you know what you're looking at or how the kiln is reacting, you can make the necessary adjustments to bring about the desired effects on the pots being fired. Once you understand this, you can fire just about any kiln. Thank you, Chad, for all that you've taught me and continue to teach me! Can't wait to fire again soon! Mixing the wadding material. Chad does things old school and collects rainwater for his shop--which doesn't have any plumbing--which is super smart!! It's free and always there! The wadding material prevents the pots and/or kiln furniture from sticking together. The wadding consists of clay, sand, and "flour to taste"--no really! These are put on the bottom of every pot, in between each post and shelf stack, under the cone packs, and anywhere kiln furniture or pots may be touching. These are the cone packs we put in the kiln to help us tell temperature. We have a pyrometer at the top of the kiln, but that only tells us the temperature in one location. These will be place at the top, middle and bottom of the kiln. This ensures an even firing. "Muddin'" the door--we fill any cracks with a clay slurry to ensure heat retention. Some of the door bricks are marked--the triangle on the brick lets us know a cone pack is behind it, and X marks the salt spot! The kiln entering a phase of reduction. This means you're limiting the amount of oxygen in the kiln, producing carbon and hydrogen, which then chemically steal the desired oxygen from the clay and glazes. If you're really interested in the chemistry, here's a good article for you! Spraying in the salt solution into the kiln. The sodium reacts with the silica (glass) in the clay and glazes to create unique surfaces and colors. And that's all the preview of pots you'll get!! You can find Chad's work in many places including my Carlisle shop, the North Carolina Pottery Center and online. Pop by for a visit to see more!